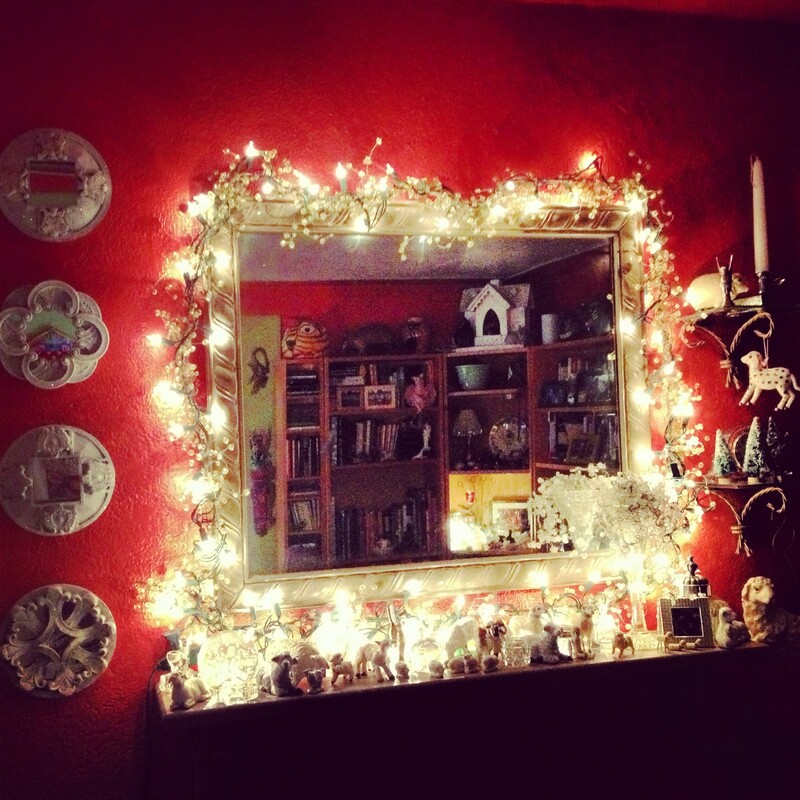 I am sitting here in front of my computer, writing and listening to Percy Faith and Mantovani”s Orchestra playing the Christmas music of my childhood. Thank you iTunes for not letting this wonderful stuff disappear from my life. I got a new photographic backdrop this week and I was just dying for a free morning to play with it. Between Instagram and my new gradient background-winning! These are my first two sheep, Germany and 56 years old. I love what it does to ‘product’ pix! 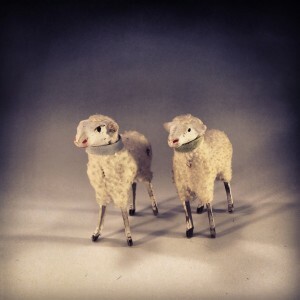 For fun, I got my two sheeps, yes sheeps, out and took their portrait. That reminded me of childhood Christmas memories of being a kid in Germany. There is no place more magical during the holidays than a German city. Its like every old fashioned Christmas card ever printed. To this day the smell of coal burning almost makes me cry with nostalgia. I loved living in Europe and I still miss it every day. that being said, I’m lucky I have so many amazing memories of Christmases past–including my sheeps. These two funny looking animals are made of plaster or clay with cotton flannel ‘wool’, painted faces and wooden legs, circa 1957. We got them as a gift from Saint Nicholas, one each for my brother and me. They always had pride of price in the manger when we were growing up although they didn’t match anything else in that elegant Italian manger. Tiny Wade sheep and English sheep and Japanese sheep mix it up. I have to hand it to my mom, she knew how to entertain kids. 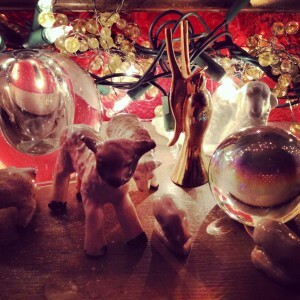 She would hand us a giant enameled tray and send us outside to build the landscape for the manger each year. Moss, trees, sticks, rocks and hours of labor went into the building before it was carefully carried inside and installed. Then we got to put the actual pieces in place. Three wisemen, a camel, a cow, a donkey, Joseph, Mary, the baby Jesus, a shepherd, his sheep and our sheep. 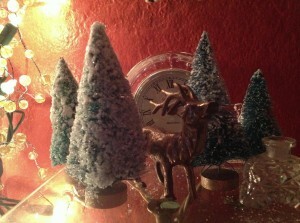 Not sheep, but I love, love, love what happens when you cover little trees with glue and roll them in glitter. So pretty! The years rolled by and I left home and sheep behind. Over time, I kept looking for the right sheep to replace those two funny looking sheep of memory. 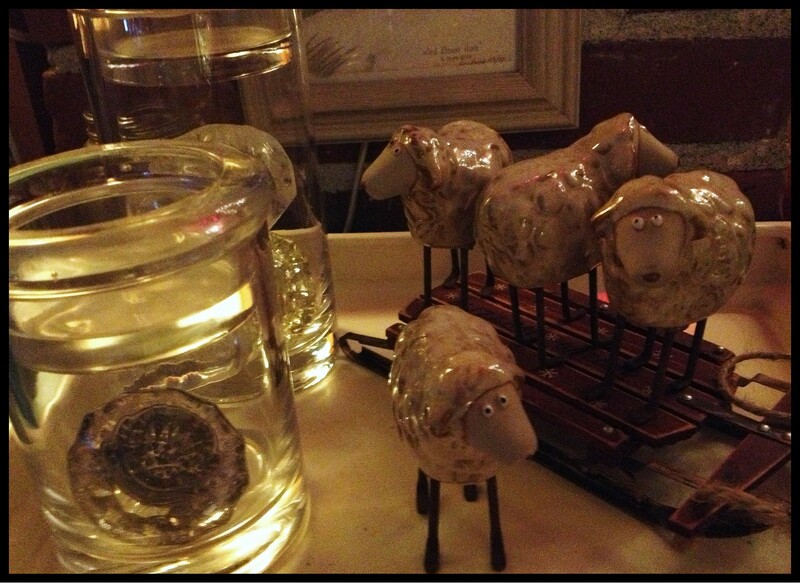 Sheep became one of my first collections and mostly they live in a cabinet these days. 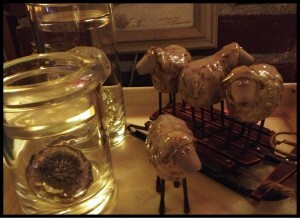 I couldn’t resist these goofy sheep from a thrift store. They remind me of my youngest son’s favorite story from his childhood, “Sheep in a Jeep”, although this is definitely a sled. 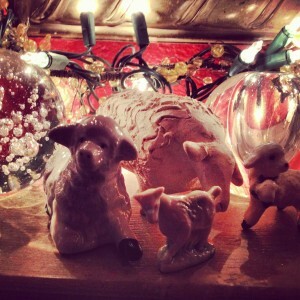 I never found a sheep to replace the first two, but last time I was home I found THEM. They were abandoned in a drawer in my mother’s antique desk. I tucked them in my suitcase and now here they are, Christmas again, 56 years later. Holy crap, how did that many years pass me by? I decided to bring the flock out and use them to decorate for Christmas. 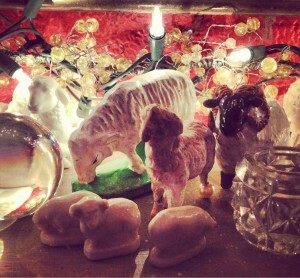 After all there were sheep in the Holy Land when Jesus was born right? 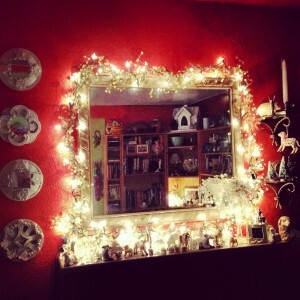 I highly recommend to anyone, if you have a collection you love, bring it out and integrate in your celebration decoration. 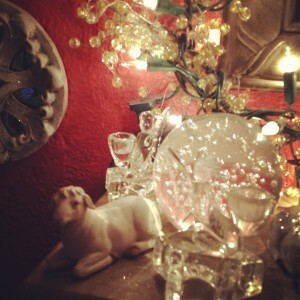 vases are pretty with crystal garland wound into arrangements, light catchers! I mixed my sheep with little bits of crystal, perfume bottles and spheres, because they do such a great job of catching and reflecting light. 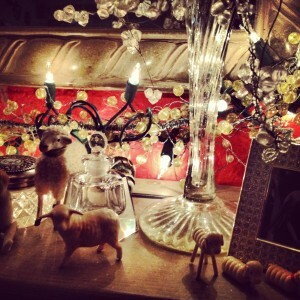 The fat sheep in the background was made by a famous Dutch artist who lives in France, I got to stay at his bed and breakfast and buy this little sheep treasure. There are my two old faves and a charming china doll, tiny, along with a crystal jar that has an enameled lid. Sparkle! 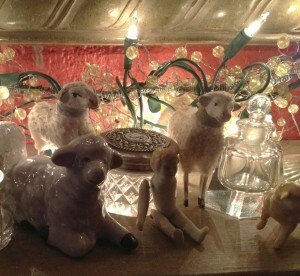 If my brother ever finds out I liberated his little sheep, in the foreground, I’m in trouble. It needed a home and now it has a whole flock! This entry was posted in Art is a tart, Christmas Bunny, Rabbit Remembers on December 13, 2012 by rox.